2005: So What Made the Cut? 2009: "Hon, Like a Good Girl..."
It's the second Thursday and that means it was time for my next luncheon with my friend Kathy. You may recall that we reinstated these lunches at The Olive Garden in Sacramento last month and are slated for our next one on April 8. It's nice to get back together with her and to pick up where we left off, after our period of getting to know you again. We talked about a lot of things today, but eventually got around to the note that was left on this journal (actually, the mirror journal, Airy Persiflage) on my "WWJD?" entry. we need for gay people evrywhere to stop expecting everyone to accept and like them. And we need for gays to STOP feeling the need to wear their sexuality on their sleeves. But there is an element of privacy and intimacy to anyone's sexual orientation that I don't feel the need to know. Just be who you are and let me like you for that. I don't care about your sexual preference. On the surface this sounds like a nice, accepting way to live, but if you think about it, it's not possible. If the writer walks hand in hand with her husband, is she wearing her sexuality on her sleeve? If Ellen and Sherry walk hand in hand, that's what they are accused of doing. If the writer meets her husband at the airport and the two share a welcome home embrace and quick kiss, are they wearing their sexuality on their sleeves? If Adam and Steve do the same thing, are they? If the writer goes on a vacation with her husband and some friends and comes back to work and shows everybody her pictures of the good time they had, is she wearing her sexuality on her sleeve? If Steve brings his pictures of his fun time with friends, is he? If he's in the military, he's in danger of being dismissed if he talks about the nice vacation he just had with his friends. The writer may not "feel the need to know" about Adam and Steve's orientation and yet somehow feels they don't need to be in the closet, but that's what this whole thing is about--the ability to be who they are without someone accusing them of "wearing their sexuality on their sleeve." Kathy and I were talking about the reaction of men to the idea of homosexuality (somehow women don't generally seem to have the same reaction). If two straight women check into a motel and their room only has one bed, they think nothing of sleeping in the same bed together. If two straight men check into the same room, one of them will probably sleep on the floor. They will go to great lengths to prove that they aren't "like that." Even entertainers whom I admire get that "ooo icky" tone to their voice when they discuss two men having any sort of affectionate relationship. They feel the need to pretend to be effeminate, raise their voices several octaves, and laugh about it. 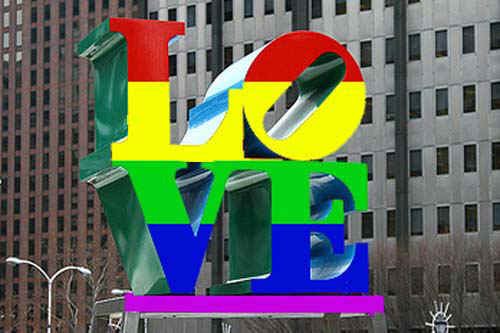 Even people I know to strongly support gay equality. But there is that need to prove that "I'm not that icky kind of person." And there is the whole "murder thing." Straight people who are murdered generally (not always, of course) are shot or blown up. Something that can be done at some distance from the victim. Gay people who are murdered generally (not always, of course) are killed in close up and personal attacks--stabbings, choking, beatings. There is some sort of visceral reaction in people who get angry with gay people. They have to touch them and make it as personal as possible. A gay man was stabbed in a robbery in Sacramento, Kathy told me, and when the police said it was a hate crime, someone questioned that...but the man was stabbed sixty seven times. That's not your random act of violence committed during a robbery. The thing about just being who you are is that gay people can't do that. If one woman is the biological mother of a child, her partner can't go pick that kid up at school, because the school doesn't recognize her as a parent. If one person in a gay couple is injured in most states in this country, the hospital has the legal right to prevent the spouse from being with him/her, with making decisions about care, or making decisions about disposal of remains, if the person should die. If the patient is unable to communicate, her family (mother, father, siblings) have the right to remove her from the hospital, take her to another states, and not let her partner of many years know where she is (this has happened). The horror stories about people who are "just trying to be who they are" are legion and one reason why gay people are fighting for marriage is to be able to say to the straight community: we just want to live our lives and not bother you, but you won't let us! I'd also love to hear what the writer of my comment would say if someone showed up at her door and told her that a vote had been taken of all the citizens in the state and it was decided that she and her husband can no longer be legally married. Gay people don't necessarily want her to LIKE them, but they do want to be respected for who they are -- and why the heck shouldn't they be respected? Just as I went to post this, I read of a school in Mississippi which has canceled the senior prom rather than allow a lesbian girl to come and bring her girlfriend. Is bringing your girlfriend or boyfriend forcing your sexual identity on someone? Should she lie and come with someone she doesn't care about on what is arguable the most imortant social date of a student's high school career? Not only does the girl not get to go to her prom, but NOBODY IN HER CLASS gets a prom...how much hatred against her do you think that is going to create?